As kids everywhere will tell you, there are few things in life more fun than jumping on a trampoline. However, many people nowadays are choosing to build trampolining and rebounder training into their exercise routines as a fun way to burn fat and improve overall-health. Enthusiasts claim that regular trampoline use has many benefits, including weight loss, improved cardiovascular function, and even improved balance and stability. In that case, it's not difficult to understand why this form of exercise has exploded in popularity in recent years. If this sounds appealing, you may be considering taking up trampoline or rebounder training as part of your own exercise routine, and wondering how it can help your overall fitness. This trend has certainly caught our attention, and we've been doing our research to find out if this form of exercise really is a good way to keep fit. Does it really provide all the benefits attributed to it? What exactly are the calories burned jumping on a trampoline? Read on to find out! How Many Calories Do You Burn While Jumping on a Trampoline? Is Jumping On a Trampoline As Good As Running? 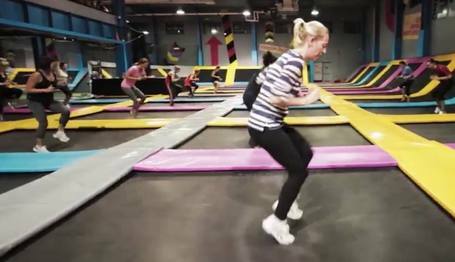 Can You Lose Weight By Jumping On a Trampoline? Can You Lose Belly Fat By Jumping On a Trampoline? There's no simple answer to this question, as the calories you will burn whilst trampolining depends on a variety of factors. First of all, your body weight plays a big part in determining how much energy you will use up. Put simply the more you weigh, the more calories you will burn in your trampoline workout. This is because it will require more energy to propel a higher body weight on a trampoline. Another key factor in determining how many calories you will burn is the type and intensity of your jumps. After all, it stands to reason that very gentle bouncing will not burn as many calories as high, exuberant, no-holds-barred bouncing that raises your heartrate and requires far more effort. If you're already a skilled trampoliner, performing tricks such as flips on the trampoline will burn more energy still. 150 pound adult: At this weight, you can expect to burn around 126 calories in 30 minutes. 200 pound adult: You will burn a bit more energy, at approximately 167 calories. If you are slightly heavier or lighter, then your overall calories burned will be slightly higher or lower respectively. If you're a seasoned runner, you may be wondering whether you could be burning more calories jumping on a trampoline. The simple answer is, probably not. Exactly how much more you will burn on a run is difficult to say, as it all depends on the distance you can cover in 30 minutes, your body weight, and whether you are able to run continuously. To give you a rough idea, if you weigh 150 pounds, 30 minutes of continuous jogging at a brisk pace could result in a calorie burn upwards of 350 calories. It'll be a little more if you're heavier, and a little less if you're lighter. The high number of calories you can burn in a short time is one of the reasons that many people opt for running as their weight loss exercise of choice. Therefore you may be wondering why anyone would choose bouncing on a trampoline over running. However, there is a key advantage to trampoline fitness over running. Over time, the impact of your feet hitting the floor whilst jogging can put strain on the joints and eventually cause pain and discomfort. Trampolining, on the other hand, is very gentle on the joints, making it a great choice for anyone suffering with a joint condition. Many people would also argue that 30 minutes on a trampoline is far more fun! Kids know a thing or two when it comes to having fun, and any kid or adult who has spent any time bouncing on a trampoline will tell you that it is an absolute blast. After all, if you find a form of exercise that is enjoyable, you're far more likely to stick to it long-term. 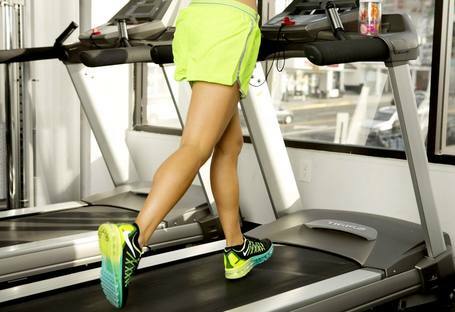 As with regular jogging, you are likely to burn more calories on a treadmill than bouncing on a trampoline. This is because running on a treadmill burns a similar number of calories to running in the street. If you don't own a trampoline and don't have access to one at your gym, you may find a treadmill easier to access unless you want to invest in a trampoline for the purpose of exercising. On the other hand, running of any type only uses a particular set of muscles. On the other hand, bouncing on a trampoline uses a far wider range of muscles throughout your body, potentially offering superior benefits in terms to developing all-round muscle tone in the whole body. 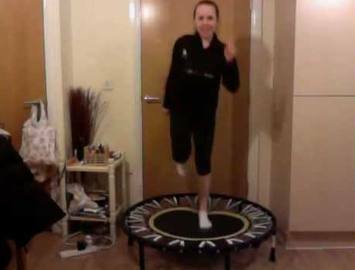 Rebounding is a form of exercise that uses a mini-trampoline inside the home. You may be wondering if it offers superior calorie-burning in comparison to your daily walk. If you're just taking a leisurely walk in the park at a gentle pace, you will definitely burn more calories on a rebounder. However, crank that walking pace up to brisk, and you could find yourself burning around 145 calories in half an hour. Like all forms of exercise, this still depends on your body weight. This puts brisk walking and rebounder training on a par in terms of calorie expenditure, as they burn around the same amount. Both forms of exercise are a great way to burn calories, aid weight-loss and improve all-round physical health. However, if you have mobility issues or don't have access to a pleasant outdoor area to walk in, rebounder training may well be a better option. 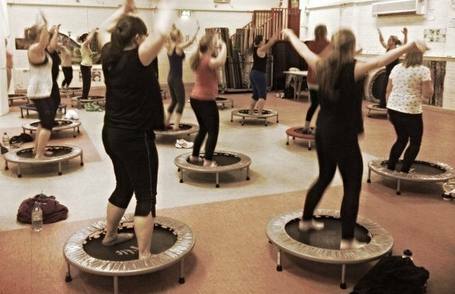 Nowadays, you can purchase rebounders with stability bars to make them extra-safe, making this form of exercise suitable for people who struggle with balance or stability. Calories burned: If the primary factor you are looking for when choosing a workout is total calories burned, then running certainly has an advantage over bouncing on a trampoline. As we mentioned above, a 30 minute run will burn significantly more calories than a 30 minute bounce. However, this depends on your body weight and running speed. Impact on joints: If you suffer from any kind of joint condition or are generally concerned about the impact exercising may have on your joints, then trampolining may be the way to go. 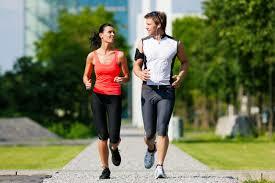 Running puts your joints under repeated and consistent impact, whereas trampoline use is very gentle on the joints. Muscles used: Running only uses a relatively small group of your body's muscles centered around one part of your anatomy. On the other hand, trampolining uses your muscles more evenly, leading to improved muscle tone across your whole body. What you enjoy: Whilst some people love nothing more than going for a run, many others loathe it. Therefore, some people may find jumping on a trampoline far more fun and easier to stick to in the long-term. Equipment needed: Running really requires no specialist equipment, although serious runners often choose to invest in special gear including running sneakers and aerodynamic clothing. If you want to take up trampolining, you will either need to purchase your own trampoline or pay to use one at a trampoline park or specialist gymnasium. There's a lot to be said for aiming for variety in your exercise routine, so there's no reason why trampoline exercises and running cannot be done in combination as part of a balanced exercise routine. That way, you can reap the benefits of both forms of exercise. Nowadays, many runners are including rebounder training in their workout regimes. This is a great idea for several reasons. 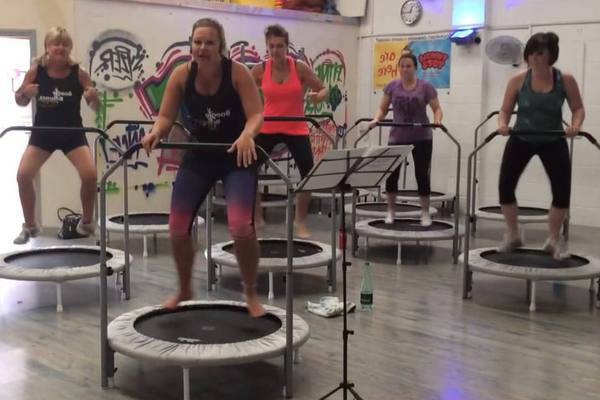 Firstly, bouncing on a rebounder will go towards improving your all-round cardiovascular health, which can only be a good thing for improving your performance when running. Also, rebounder training improves core stability. This is vital for runners, as a strong core can help to guard against injuries when you're out pounding the pavements. Finally, many users find that mini-trampoline exercises promote healthy posture. Good posture is absolutely vital for runners, as running with poor posture is a big no-no and can cause injury and discomfort. Only got a few minutes to exercise? While you won't burn so many calories in 10 minutes, you could still hope to burn around 42 calories after 10 minutes bouncing if you weigh 150 pounds. Whilst this might not sound like a lot, it can really add up if you build in a few 10-minute bouncing sessions around your busy lifestyle. Unfortunately, a lot of the most popular sites and apps that calculate the calories burned during a workout don't have a calculator specifically for rebounding. However, after a bit of searching, we finally found one! Head over to www.self.com to check out their rebounding calculator. When it comes to losing weight, it's a pretty simple formula. You simply need to burn more calories than you are taking in to create a calorie deficit. As rebounding and trampoline jumping burn far more calories than staying still, it's a great way to increase the number of calories burned vs. the amount you are taking in. As a result, your body has to start burning its fat reserves for energy. Over time, this should help you towards your weight loss goals. However, trampoline training will only help you to lose weight if you combine it with overall lifestyle changes. A healthy diet, reducing the number of calories you eat, and making sure you make time for enough sleep are among just some of the other important factors in achieving successful weight loss. Therefore, you should view bouncing on a trampoline as just a part of your weight loss strategy. When we're losing weight, a key problem area for many of us is our bellies. Many people trying to lose weight report finding getting rid of the fat on their bellies as being far more stubborn. So, if you're considering adding trampolining to your exercise routine, you may be wondering if it can help you shift those pounds you're carrying on your tummy. To help answer this question, we asked a personal trainer to give us the low-down, and the answer is very positive. His advice is that, whilst you can't target fat-loss in specific areas, when you burn fat you burn it all over your body. Therefore, any exercise that creates a calorie deficit such as trampolining will help you lose fat all over your body, including on your belly. As we mentioned above, in order to lose weight you will need to look at your diet and calorie intake as well as focusing on calorie-burning through exercise. Hopefully, now you've read a handy guide you'll be well on your way to deciding whether bouncing on a trampoline could help you towards your health and fitness goals. Now you know the specific health benefits and the calories burned jumping on a trampoline, you at well feel it's worth building in some bouncing fun into your wellness programme. A word to the wise, though. If you're new to exercise or suffer from any health conditions, we recommend consulting your physician before embarking on any new form of exercise. They will be able to advise you on whether jumping on a trampoline is a safe and beneficial way for you to work out. Happy bouncing!